Teddy’s 150th Birthday Party Photos | Let Teddy Win! It’s been a busy couple of days for Nationals’ racing president Teddy Roosevelt. After running the entire Marine Corps Marathon race on Sunday, Teddy celebrated his 150th birthday with a party last night at Hudson Restaurant in DC. Patrons posed for photos with the guest of honor, who shared slices of birthday cake for everybody in attendance. Photos courtesy of Sol Tucker/Push Media Group. 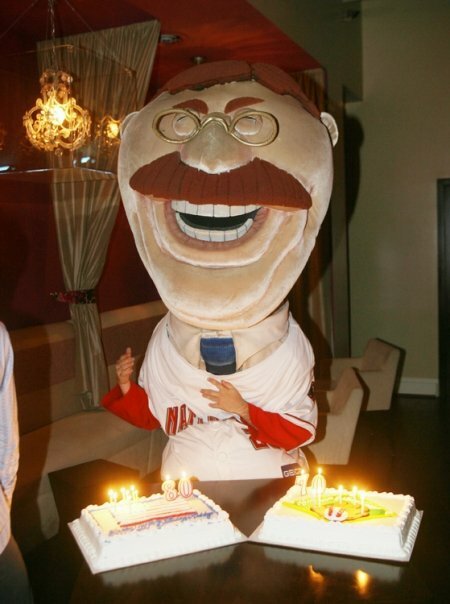 Racing president Teddy Roosevelt gets the first slice of his 150th birthday cake from Washington Nationals ball girl Cheryl Hackley on Monday night at DC's Hudson Restaurant.